Someone had requested me to make a way to eat noodles. This girl loves noodles and was off them for a long time for health reasons. To loose some weight specifically. I went to the neighborhood bakery that day which stocks some freshly made noodles, bought a packet and then bought a pack of tofu and baby corn as I love them both in a Chinese style meal. When I started preparing it. Arvind came into the kitchen and said he wanted only baby corn and no tofu. So I opened 2 packs of baby corn (weighing 200 gm each) and used them both for our one dish dinner that day. I am glad I did as it was yummy and filling. So the noodles are simple carbs no fiber kinda food and we need to fortify them with enough protein and fiber, this helps in minimising the amount of noodles per serving as well. This way you get some carbs from the noodles but you are capable to lessen the glycemic load of the meal. Works fine. large fat variety of green chillies 4-5 nos. Boil the noodles in salted water for just 3-4 minutes. They cook quickly if they are fresh, otherwise follow packet instructions. In the meantime mix together the Baby corn ears, chillies of both types if using, ginger, garlic, Coriander stems, salt and pepper and a little dark soy and toss together. Now heat the sesame oil in a wok and chuck the baby corn ears seasoned with all the herbs and soy, toss together on high/medium flame. The baby corns need not to cook completely, we need a bit of bite in them. 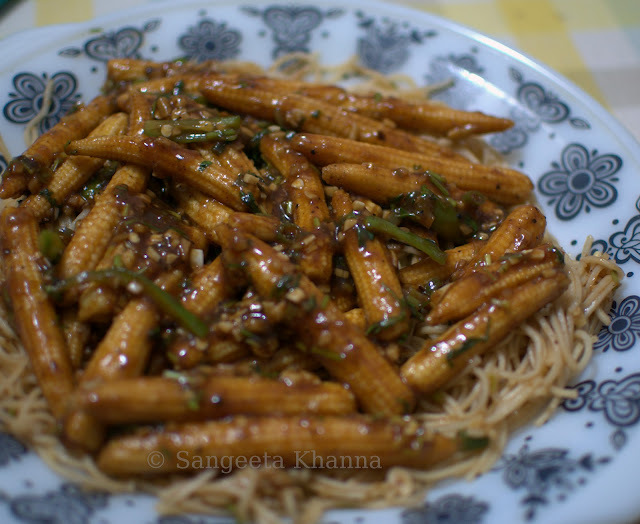 Mix the ketchup, a little dark soy and a tbsp of water with the corn flour and pour it into the cooking baby corn mix. Mix immediately till there is a coating of glaze all over. Add the coriander greens, mix well and take off heat. Strain the noodles, toss with a little sesame oil and lay them all in a serving plate. 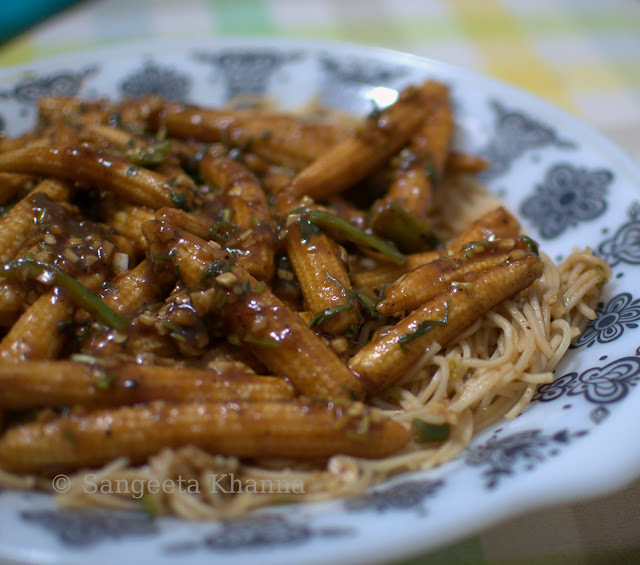 Top it up with the baby corn manchurian style. You could always add some tofu in this medley. Even some bell peppers, I avoid them as the husband is intolerant to them. So about a 100 gm cooked noodles with 400 gm of baby corn for 2 servings is an awesome way to lower down the carb load in a meal. Added tofu would be great and so would be some chicken or shrimp in the same. My friend is happy she can have noodles once in a while. Variety is the spice of life, even I don't mind some noodles once in a while. But never the 2 minutes kind. Never ever. Get them made fresh if you have a facility around. This is fabulous ！I so love your tips and tricks ! Thanks Ruchira. Hope it helps choose better options for all of us.